Georgia Skelton has made the podium for the second time at the Junior World MTBO Championships in Austria. 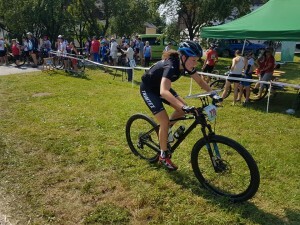 After her 4th place finish in the middle distance, Georgia has followed up with 6th place in the sprint race ridden on Sunday, 77s behind the Czech winner and less than 30 seconds from the bronze medal. New Zealand’s other Junior Woman, Tegan Knightbridge finished in 19th place, while Conal Boland-Bristow as 79th in the Senior Men. Junior Women: 1. Vilma Kralova (CZE) 16:19, 2. Uliana Sukholovaskaya (RUS) 16:53, 3. Lea Hnilica (AUT) 17:08, 6. Georgia Skelton 17:36, 19. Tegan Knightbridge 19:27. Thins were a little tougher for the 3 Kiwis in Saturday’s long distance where only Tegan recorded a finish (18th) while Georgia mis-punched and Conal was disqualified. Georgia is only the second junior, after Tim Robertson, to make the podium at the junior MTBO Championships, and to do it twice at her first such event is an exceptional performance.